Macdonald Hotels & Resorts is set to unveil a fleet of state-of-the-art golf cars at venues across the UK, following a renewed four-year deal with Club Car, a world-leading manufacturer of small-wheel, zero-emissions electric vehicles, through licensed dealer Carryway, who deliver and maintain the vehicles. The agreement marks an extension of a long-standing partnership with Club Car, Official Supplier to the European Tour, and specialist golf vehicle dealer Carryway, which will see the arrival of 137 Tempo golf cars. Five of the group’s golf venues including Macdonald Portal Hotel, Golf & Spa, Macdonald Hill Valley Hotel, Golf & Spa, Macdonald Cardrona Hotel, Golf & Spa, Macdonald Linden Hall Golf & Country Club and Macdonald Spey Valley Resort will receive the new vehicles. Modern and distinctive in styling, the Tempo golf cars are some of the most hi-tech in the industry. The new fleet has been upgraded with drinks coolers, premium leather seats and bluetooth technology allowing golfers to connect their devices for phone calls or entertainment purposes. The new vehicles represent a strong investment in the golf facilities on offer at the hotels, which have a reputation for being some of the finest in the country. Earlier this year Macdonald Hotels & Resorts announced a partnership with the PGA EuroPro Tour for the forthcoming 2019 golf season, which will see four tour events played at a Macdonald Hotel golf course this summer. Kevin Hart, Director of Golf Sales EMEA at Club Car, said: “We have always been proud to work with Macdonald Hotels & Resorts, and the extension of our partnership means that their guests can rest assured that they are getting the best on the market when they play at a Macdonald venue. 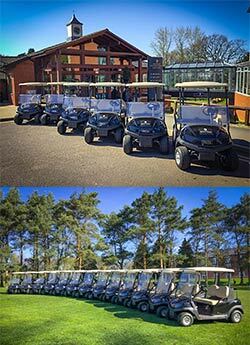 Picture Caption 1: The newly installed fleet of Club Car Tempo at Macdonald Hill Valley Hotel Golf & Spa; one of five Macdonald venues across the UK to take delivery. Picture Caption 2: Macdonald Hotels & Resorts unveil new fleet of Club Car Tempo at venues across the UK following a renewed four-year deal. Ingersoll Rand (NYSE:IR) advances the quality of life by creating comfortable, sustainable and efficient environments. Our people and our family of brands – including Club Car®, Ingersoll Rand®, Thermo King® and Trane® – work together to enhance the quality and comfort of air in homes and buildings; transport and protect food and perishables; and increase industrial productivity and efficiency. We are a $13 billion global business committed to a world of sustainable progress and enduring results. Club Car has been one of the most respected names in the golf industry for more than half a century. The Club Car product portfolio has grown to include much more than golf cars, now encompassing golf and commercial vehicles, multi-passenger shuttle vehicles, rough-terrain and off-road utility vehicles and street legal low-speed vehicles for commercial and consumer markets. For more information, visit www.clubcar.tv, www.clubcar.com or www.ingersollrand.com. Established in 1990 by Donald Macdonald and colleagues, over the past 25 years Macdonald Hotels & Resorts has successfully expanded from its beginnings in Aberdeenshire to become the UK’s largest privately-owned hotel group. Operating 53 hotels throughout the UK, Ireland, Portugal and Spain, the group continues to invest and now employs over 4,000 staff and operates in excess of 4,500 hotel rooms. Macdonald Hotels & Resorts is proud of its promise to serve only the finest and freshest produce, with flavoursome dishes always prepared from whole raw ingredients. A forward-thinking, environmentally responsible hotel group, through its ‘Room 20’ programme led by internal ‘green teams’, Macdonald Hotels & Resorts continues to focus on achieving ambitious, self-imposed energy saving targets. This unwavering commitment to achieving the highest quality standards in every aspect of the business has seen Macdonald Hotels & Resorts receive numerous prestigious accolades. This has included named 2012-2013 AA Eco-Hotel Group of the Year, receiving the MIDAS award for the Best Breakfast 2011/12, a 2012 Good Egg Award by Compassion for World Farming, the National Customer Service Awards for Leisure and Tourism and the coveted 2013 Carbon Trust Standard.